Heating, Ventilation, Air Conditioning and Refrigeration (HVAC-R) student Matt Atkinson always knew he was pretty good with his hands. A non-traditional student with a penchant for hands-on learning, Matt decided he wanted a career doing something other than sitting behind a desk. Matt, an Army veteran, husband and father of three, found himself with a host of responsibilities all too familiar to many non-traditional students, when he decided to go back to college at age 35. At ICC, Matt had a variety of classes to choose from that could meet his demanding schedule day or night. Coming from a background in construction, Matt picked HVAC-R because he felt it was one of the better programs for his return on investment. 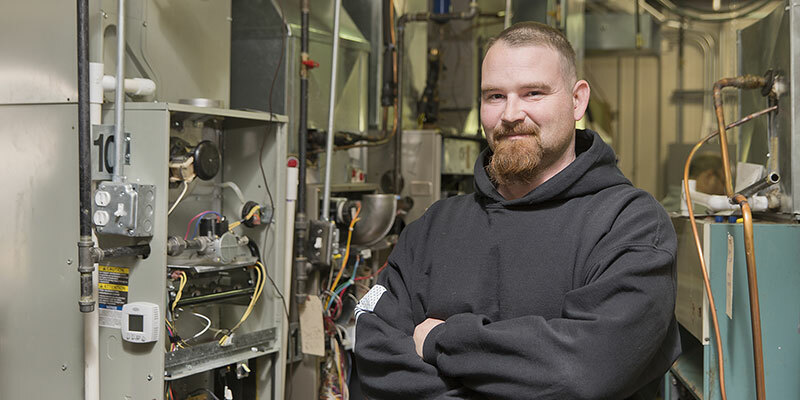 After investing in his future, Matt has since graduated from the HVAC-R program and now has a sense of pride in himself that he didn’t have before. Are you looking to invest in your future? Whether you are a traditional or non-traditional student and regardless of your schedule, Illinois Central College will help you attain the career that is right for you! Search our programs to find the right one!